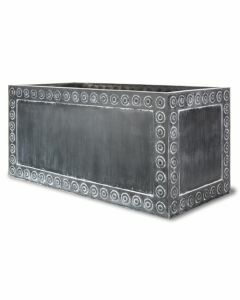 These large Cromwell planters look distinctive with a decorative pattern created by rivets running around each side. The bold design makes them ideal for making a statement in your garden. Shown here in antique faux lead finish. Made from lightweight fibreglass, even the largest plant pot at can be handled with ease. The planter is available in the antique faux lead finish and is available in three different sizes. The small planter measures 19.7" X 19.7" X 19.7"H, the medium measures 24" X 24" X 24"H and the large measures 36.2" X 36.2" X 29.9"H. Please choose the size from the drop down menu. Click on image for greater detail.